Here we will discuss how to remove password lock and pattern lock for the Xperia Android smartphones? To remove lock on Xperia devices, can be done by following the below simple steps, you do not have to flash the whole firmware for unlocking the devices, just download the Xperia lock remove .ftf file and flashing using the flash tool. So here we will show you how to remove lock or pattern lock on Xperia mobile phones. No need to flash the full firmware, which is large in size and difficult to someone to download from the Internet, So here is the download links for Only Lock Remove firmware ftf files, which can be download easily and flash the phone to remove pattern and password lock of Xperia all models. 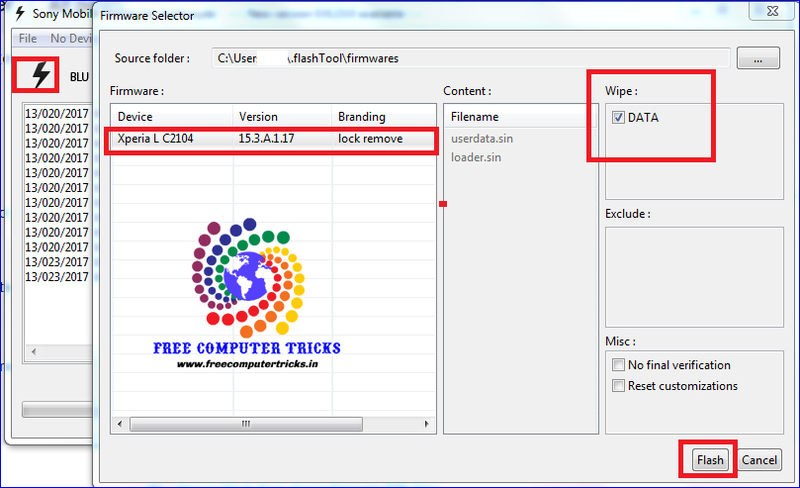 The below is the details of how to flash the Lock remove ftf files using flash tool. Some lock remove ftf files may not support the latest version of the xperia flash tool, so please flash the ftf using any older version of this tool. Some of the file will not show in the flash panel to flash the phone, if you use latest version of flash tool. How to Flash Lock Remove .ftf File Using Flash Tool? 1) Download the flash file according to the model. 3) Open the flash tool. 4) Click on Flash Device button and choose flashmode. 6) Now select the file according to the model number of the phone. 7) Select DATA OR USERDATA to wipe or hard reset the xperia phones. 9) Wait until the flashing process is complete. How to Flash Xperia Lock Remove ftf File? That's all now you have successfully flash the Xperia phone to remove password and pattern lock, to know more about Xperia device flashing you can visit the below links. Note: We are not responsible for any damage to your device, do at your own risk.